Career Development partners with faculty and staff to provide students with resources and tools to assist with student career development. Whether you are a faculty advisor, FTS advisor, internship supervisor or student employee supervisor, we hope the information below will help you engage your advisees in their career development. 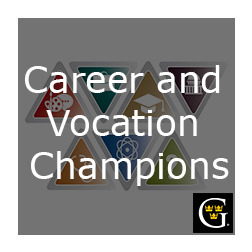 NEW for Faculty and Staff - become CAREER AND VOCATION CHAMPION! For more information and to register for the next training (February 7, 2019), click here. Recommend the Strong Interest Inventory for students undecided about majors or specific careers. Recommend Peer Career Advising for students needing assistance on resumes and cover letters. Recommend industry specific groups and individuals to follow on social media (LinkedIn, Twitter, etc.). Refer students to Career Development and the Career Development website. Refer Pre-Health students to the Health Professions website. Recommend student groups on campus related to major/career field.